"On the Path to Pluto, 5 AU and Closing"
Pluto isn’t quite the next exit on New Horizons’ voyage through the outer solar system, but the destination is definitely getting closer. Today the NASA spacecraft speeds to within five astronomical units (AU) of Pluto – which is less than five times the distance between the Earth and the sun, or about 460 million miles. "It's exciting to be closing in on the Pluto system,” says Alan Stern, New Horizons principal investigator from Southwest Research Institute, Boulder, Colo. “The encounter begins in January 2015 – just over 14 months from now. You can really feel the energy level rising on this mission!" Since launch in January 2006, New Horizons has covered more than 2.7 billion miles (4.4 billion kilometers) – about 85 percent of its journey – putting it in an exclusive club of deep-space explorers that includes NASA’s Pioneer 10, Pioneer 11, Voyager 1 and Voyager 2. In fact, the next milepost on New Horizons’ path comes next summer, when it crosses the orbit of Neptune on Aug. 25 — exactly 25 years after Voyager 2 made its historic exploration of that giant planet. When New Horizons arrives at Pluto on July 14, 2015, it will have traveled farther than any spacecraft ever has to reconnoiter its prime target. 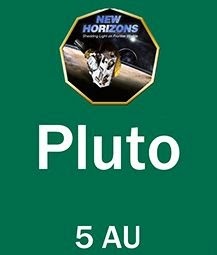 Use the blog's search engine for more on this mission and Pluto.